Manhattan has Chelsea Piers, Bowlmor, and the Port Authority bowling alley. But what about Brooklyn? The only bowling alley I know of in Brooklyn is Melody Lanes in Sunset Park, and the miniscule lane or two at Brownstone Billiards in Park Slope. Until now - and this one will blow all of those other alleys out of the water. 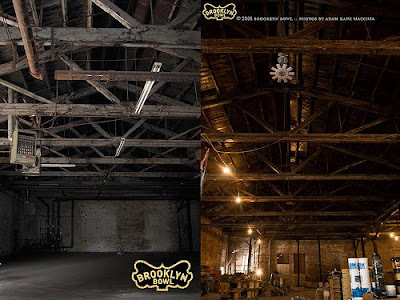 It's not open for business yet, but Williamsburg's Brooklyn Bowl looks like a great place to knock down some ten pins and a few pitchers of local beer. The great thing is, it's not just a fun spot to recreate with friends, it's also got eco cred. All this from Peter Shapiro and Charley Ryan of Wetlands, an environmentally conscious music and activist venue. I'm not a great bowler, but I can't wait until they open, just to check out the space.